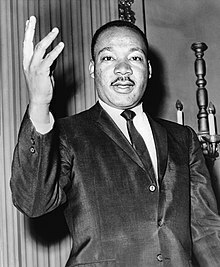 Martin Luther King, Jr. (Januar 15, 1929 – Apryle 4, 1968) wis an African-American activist, clergyman an leader o the ceevil richts muivement. He wis born in Atlanta, Georgie an wis assassinatit in Memphis, Tennessee. He won the Nobel Peace Prize in 1964.